The Reason S20 series of managed Ethernet switches are designed for power systems and industry applications to provide enable an IEC 61850 digital substation network, including layer 3 functions, cyber security and IEEE 1588v2 Precision Time Protocol (PTP). Manufacturing for the T1000 has been discontinued, replaced by the S20 switch. The MultiLink ML3000 Series Rack Mountable hardened Managed Ethernet Switches (the ML3000 and ML3100) are designed specifically for use in Industrial Facilities, Substations, and Transportation Environments. They are 1588v2 boundary clock and transparent clock capable for high precision timing applications, such as synchrophasor and IEC 61850 Process Bus. Models with optional field replaceable power supplies are also available. The MultiLink ML2400 is a 19” Rack Mountable hardened Managed Ethernet Switch that is designed specifically for use in Industrial Facilities, Substations and Transportation environments. It will supply you with reliable, high speed networking of all your mission critical applications and provide flexibility and security with easy to use management functions that are unsurpassed in the industry. The MultiLink ML1600 is a 9” Panel Mounted hardened Managed Ethernet Switch that is designed specifically for use in Industrial Facilities, Substations, and Transportation environments. With support for a variety of power supply types and port options for copper, fibre or gigabit connectors, the ML1600 is ideally suited for almost any type of application, infrastructure or location. The MultiLink ML1200 combines all the reliability and flexibility of the MultiLink family with a compact, rugged package that is suited for small to medium-sized deployments. With configurations up to 12 ports, the ability to mix Fiber, Copper, and Gigabit connector types, and support for Power-over-Ethernet, the ML1200 provides powerful, reliable networking for almost any environment. The MultiLink ML810 is a 10-port compact managed Ethernet switch that features cost-effective configurations and form factors in panel or DIN mounting options. The ML810 supports up to 8-ports PoE, which can reduce wiring costs for security applications. The MultiLink ML800 is 9” Panel Mounted switch that is ideally suited to low-density industrial networking. With a full set of management and security features, in addition to support for up to 2 gigabit ports in addition to 8 ports that can be configured for either copper of fiber connectors, the ML800 combines big switch brains with a compact rugged casing suited to almost any application. The MultiLink ML600 is a Compact Unmanaged Ethernet Switch that is ideal for Industrial Facilities, Substations, and Transportation environments that have few Ethernet devices in one location. As a very cost effective solution, the ML600 will supply you with high speed networking in your harsh environments and is equipped with Link Loss Learn (LLL) that allows for use in redundant architectures thus ensuring you will always have access to your devices. 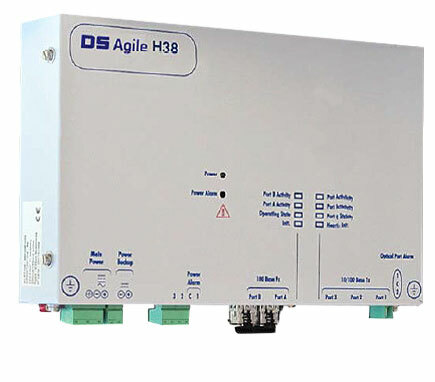 The DS Agile H38 is a range of standalone Ethernet switches compliant with the IEC 62439-3 Clause-4 PRP protocol, providing redundant, inter-operable, data communication. This redundancy box – ‘RedBox’- also supports the Precision Time Protocol (PTP) according to IEEE 1588 v2, to deliver precise local time synchronization to the IRIG-B port. 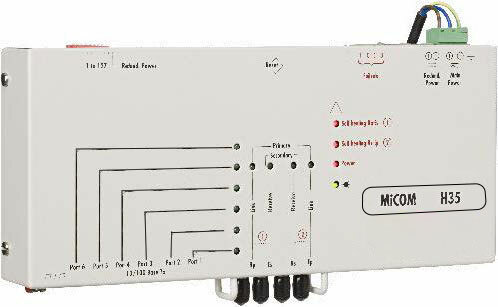 The MiCOM H series Ethernet switches use cutting edge redundancy protocols to offer superior network availability and extremely fast reconfiguration in the event of link failure.